On April 30, the Class and Components Milk Prices for April were announced. The Class III milk price, all component prices, and the commodities behind those prices are all up over the prior month. The Class III milk price is $24.31/cwt., an all time high. One important area that fell was the nonfat dry milk price, which drives the Class IV price. The Class IV milk price was at record levels in February and March of this year. 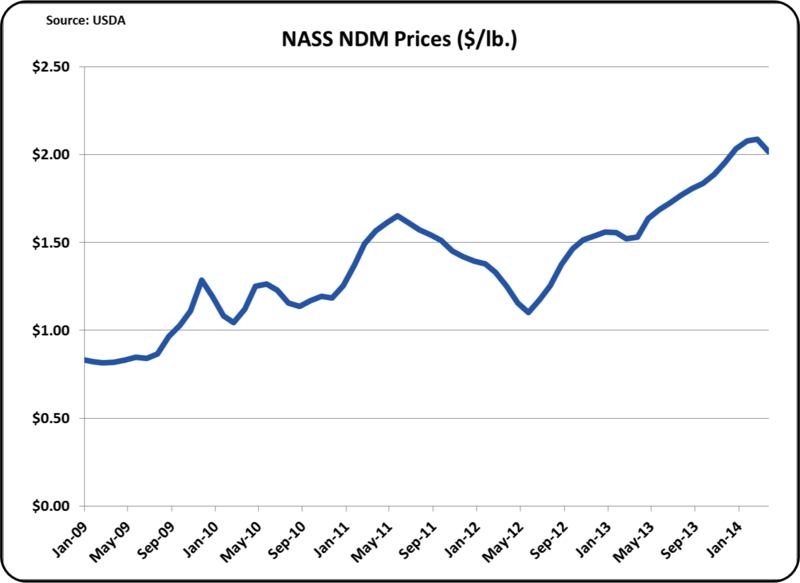 Nonfat dry milk pricing is primarily dependent on the export market and international prices. Protein prices are only a penny from being at an all time record. The April protein price is $4.7089 and the highest ever was $4.7193 in June 2008. 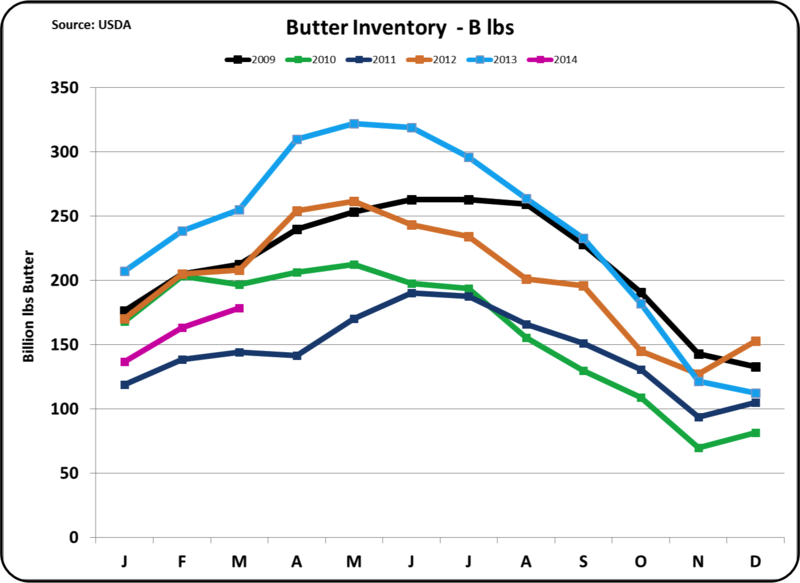 Butterfat is priced at $2.12/lb., a very good price but not near record levels. Other Solids, priced at $.49/lb. are also a very good price, but are not a record price. Combined, and as calculated by the USDA standardized formulas, the three component prices worked together to make the Class III price a record. 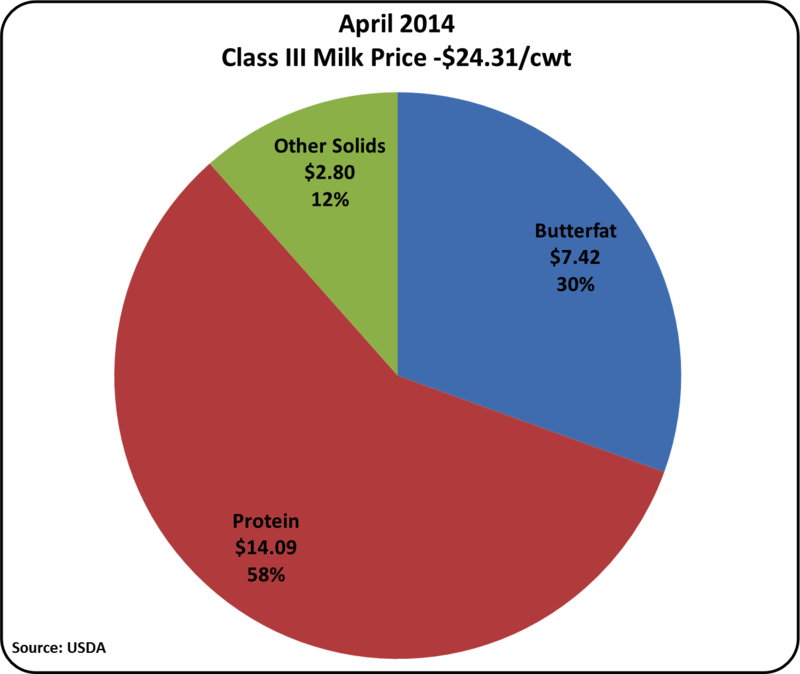 The pie chart of the Class III milk price was nearly identical from the prior months, with all three components up in value, but with similar percentage slices of the pie. Payment for protein continues to dominate the price of milk. Many of the drivers behind the changes were the result of the volatile and growing export market. For more detail, please refer to the prior post to this blog. Exports of cheese and butter are both very strong resulting in higher protein and butterfat prices. The other solids price is based on the price of dry whey and the price of dry whey is driven by exports which account for 65% of dry whey production. 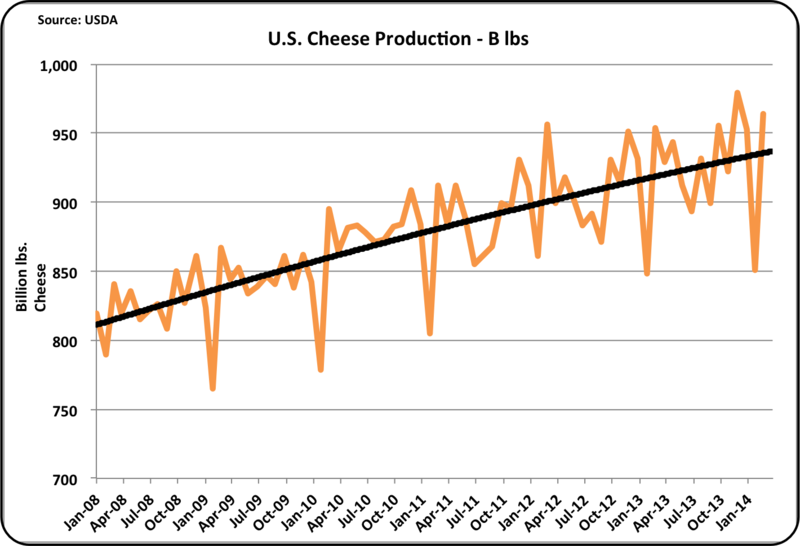 Cheese production continues its growth pattern. The production was low in February but recovered in March. February is a short month and is typically the lowest month of the year. This February was no better than the last two Februaries, so the growth curve in coming months will continue to be followed closely. 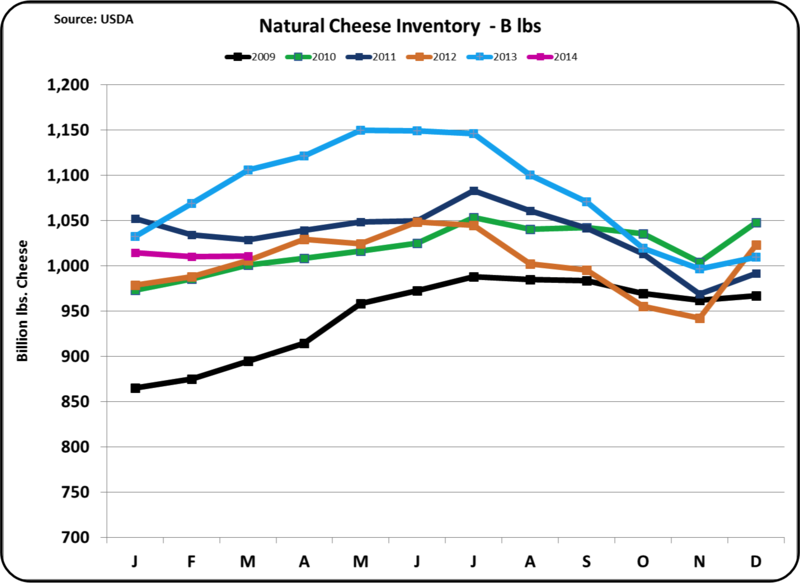 The pressure on inventories has increased the NASS price of cheese to an all time high. If exports remain strong, the price should also remain strong. The NASS cheese price is tightly correlated to the Class III milk price. 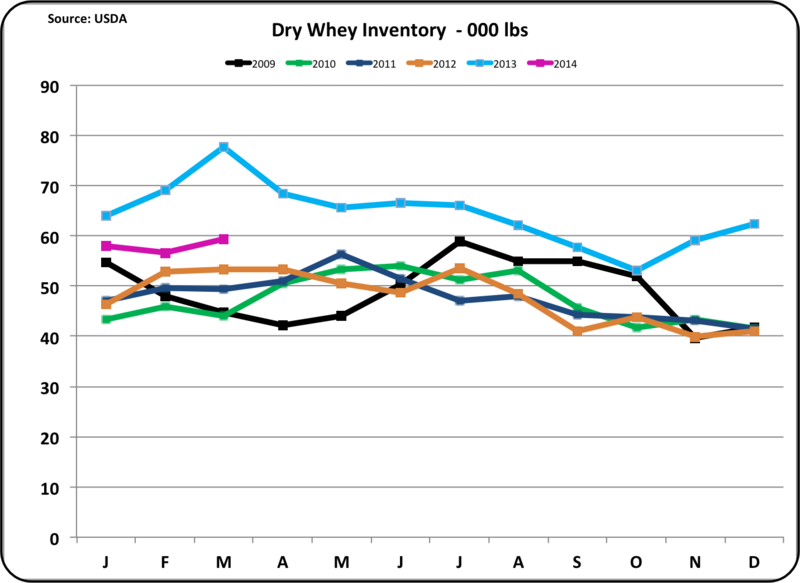 Butter and dry whey inventories also remain lean. 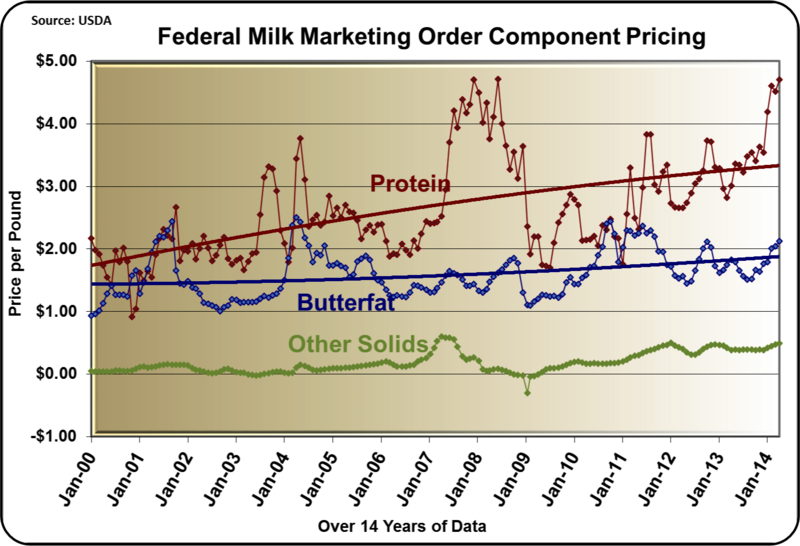 Butter pricing is the basis for the producer butterfat price and dry whey is the basis for other solids pricing. Exports of both these items are strong, which is keeping inventories low and prices high. As covered in the February 25, 2104 post to this blog, nonfat dry milk prices which drive the Class IV prices have been exceptionally high, making the Class IV price higher than the Class III price. This was providing a boost to the Class I and II prices and gave a revenue boost to all producers selling in the FMMOs. Currently exports of nonfat dry milk are below the pace of 2013, so the relative Class III and Class IV prices have reversed and Class III price is now above Class IV. 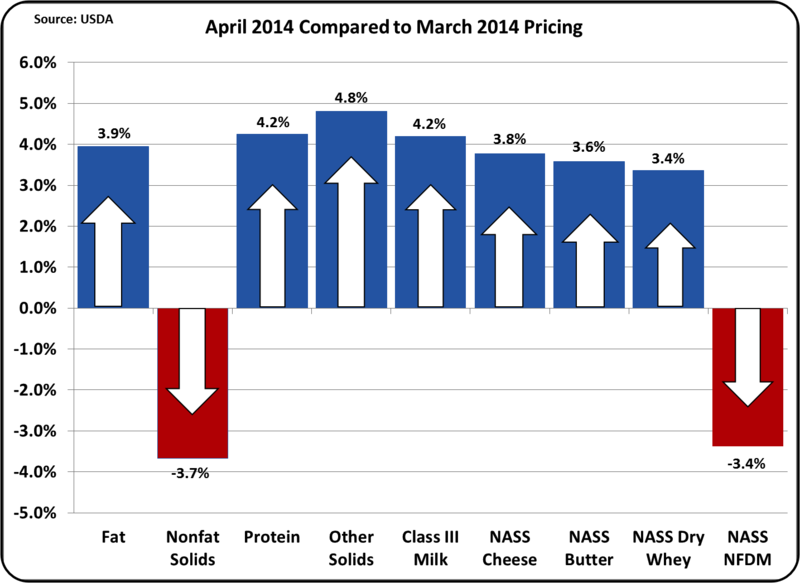 As shown in the chart below nonfat dry milk prices peaked in March and fell in April. With exports below late 2013 levels, the price may continue to decline. The current and future CME prices for Class III and IV milk and block and barrel cheese, all show declining prices. After hitting record highs, it's normal to expect prices to decline. However, the demand and resulting pricing depends largely on what happens in the export market. The key exports are cheese and nonfat dry milk. 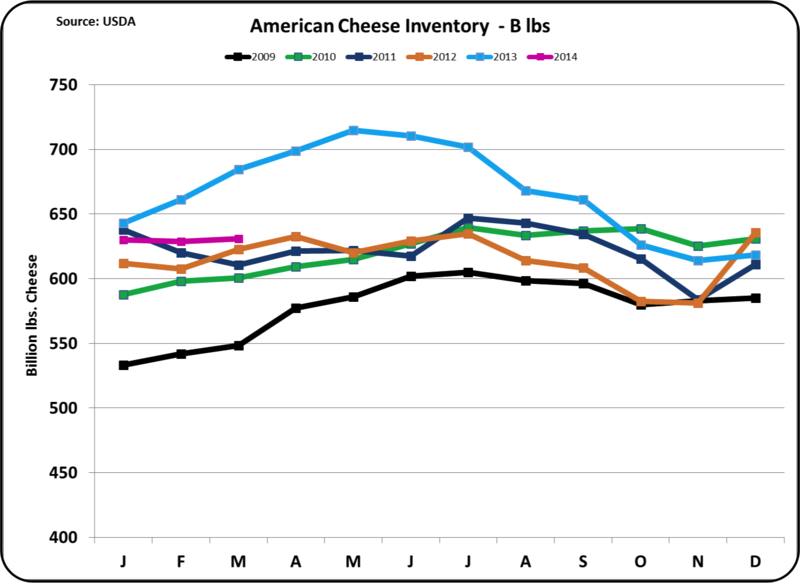 The most recent data show a decline in nonfat dry milk exports, but increasing strength in cheese exports. These very important factors will continue to be followed in future posts.